For knowledge-intensive organizations, it is important to carry out an objective assessment of their current position in the area of knowledge management activities and processes. Uncertainty presents a barrier to the introduction of suitable activities for improving knowledge management. We believe that the results of the research will be significant to practice and will provide substantial support for leaders and managers. Moreover the right knowledge management activities can help push thinking beyond the everyday in a way that spurs innovative creativity. To ensure success and long-term existence of any organizations effective application of organizational knowledge and knowledge management practice is of critical importance. 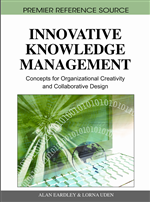 Besides simply assessing the benefits inherent in knowledge management, the organizations must learn to recognize and manage the different areas of their knowledge management practice. Our innovative solution, the “Knowledge Management Profile” is devoted to the formulation of a new knowledge management maturity model, which is believed to be of vital importance in the quest of the successful knowledge management practice. “In an economy where the only certainty is uncertainty, the one sure source of lasting competitive advantage is knowledge.”(Nonaka, 1991, P.96). The knowledge economy influences the innovation process and the approach to innovation. The traditional idea that innovation is based upon research and interaction among organizations is replaced by the current social network theory of innovation, where knowledge plays a critical role in fostering innovation. In the knowledge economy, innovation has become central to achievement in the business world. Organisations have begun to re-evaluate their products, services and corporate culture in the attempt to maintain their competitiveness in the global markets of today. The organizations need to develop, collect, share and implement organizational knowledge efficiently and effectively.The more forward-thinking companies have recognised that only through such root and branch reform can they hope to survive in the face of increasing competition. At the same time, organisations need new initiatives to develop the methodologies and tools to support the management of innovation in business. Higher education establishments, business schools and consulting companies are developing appropriate methodologies and tools. Innovation exists in many forms. In addition to traditional technological innovation, there is innovation through new business models, new ways of organising work. Managing and exploiting to best effect all these different kinds of innovation represents a major challenge today (EC 2004). In March 2000, European Union heads of state and government agreed on an ambitious goal: making the EU “the most competitive and dynamic knowledge-based economy in the world, capable of sustainable economic growth with more and better jobs and greater social cohesion”. They designed a digitalized economy and society where the living standard and the working conditions are improving, job opportunities are expanding and productivity is continually increasing. One of the essential prerequisites for the attainment of those objectives is to disseminate info communication technologies (ICT) to the greatest possible extent. In Lisbon, instead of emphasizing the macroeconomic stability of the European Union, the leaders announced structural reforms, with particular consideration to the field of expanding the digital society, which in turn should promote the foundation of the knowledge society (Blanke et al. 2002). Knowledge and innovation play an essential role in the knowledge society. The emergence of the knowledge based economy, the globalization and the competition have impacts on organizational growth, sustainability and survival. For most of the organizations, innovation and managing knowledge are no longer extraordinary conceptions, but rather necessities and a means of sustaining economic development and competitiveness (Uden et al. 2007). Our main objective was to develop a practically applicable and, at the same time, theoretically and methodologically founded approach that contributes to the exploration and realisation of knowledge management-related organizational activities. Our innovative solution is devoted to the formulation of a new knowledge management maturity model, which is believed to be of vital importance in the quest of the successful knowledge management practice. We attempted to model the factors governing knowledge management practice in organizations. During development, the entity is stepping forward from one level to the next one and no levels can be left out.